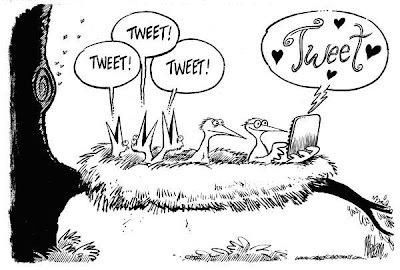 Muchos analistas se preguntan que pasará con Twitter (hoy todos parecen tener razones para comprar la compañía, especialmente Google), porque la red social no sólo debe mostrar que es una gran herramienta (lo es, incluso más allá de la moda), sino que además debe sobrevivir como modelo. Esta semana sus fundadores dijeron que la publicidad no era el horizonte (por supuesto) de la compañía, lo que nuevamente despertó los tres caminos más obvio de financiamiento: como buscador, como carrier y como generador de contenidos. Sin embargo, como suele suceder cuando se mezclan negocios con buenas ideas en medio de una burbuja, tampoco hay claridad en esto, ni siquiera en la gran capacidad de Twitter para generar aplicaciones a partir de su uso. Pero a pesar de los pronósticos, lo único que no está en duda hoy, es que no dejan de aparecer buenas herramientas para periodistas. Miguel Paz ya ha publicado bastantes en su Blog y la que sigue es una lista preparada por Mashable sobre redes y útiles directorios. 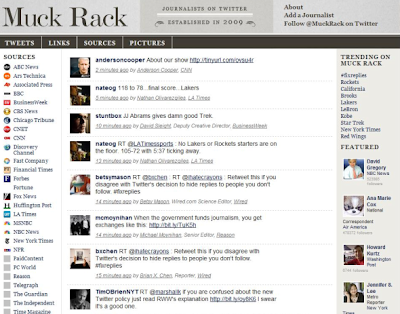 Muck Rack is a site compiled of real-time Twitter activity by journalists. See what journalists are reading, following and talking about. The site is searchable by news organization, tweets, links, and photos submitted by journos. 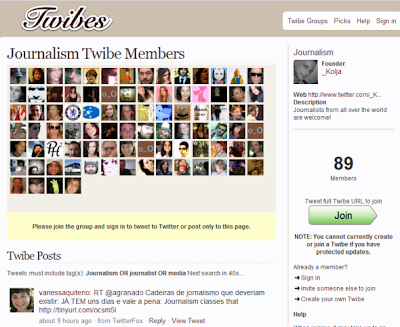 Journalists can be recommended for inclusion on the site. When users submit a journalist, they can fill in a news organization that has not yet been added and explain more in the comment field. TweetDeck’s dashboard allows users to follow groups, track topics in real-time by keyword, organize tweets, @replies and Direct Messages. Patrick Thornton (@jiconoclast), editor and lead writer of BeatBlogging.org, posted a great how-to video outlining the tools he uses for Twitter for reporting, finding story ideas, monitoring beat blogging and live blogging. Thornton’s video shows how he follows his friends’ tweets (journalists using social media or people talking about social media) on TweetDeck() to see what they’re working on and the tools they’ve discovered in social media. He points out that replies are helpful for crowdsourcing. Need a source? Then follow Peter Shankman (@skydiver), founder of Help a Reporter Out, on Twitter. He’ll typically post tweets prefaced by UrgHARO: with instructions on the topic and how to respond. Help a Reporter Out touts more than 100,000 sources. HelpAReporter.com has a sign-up page in which sources can get up to three emails daily with 15 to 30 queries per email. Journalists submit their queries using an online form. 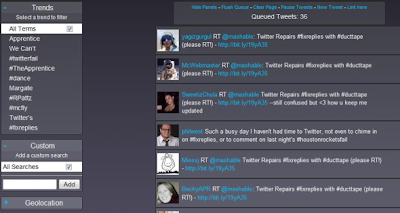 An exhaustive Twitter directory created by Digg() founder Kevin Rose called WeFollow() allows journalists to find other news professionals or even experts by hashtag. Tweeps are listed in order of the number of followers they have. 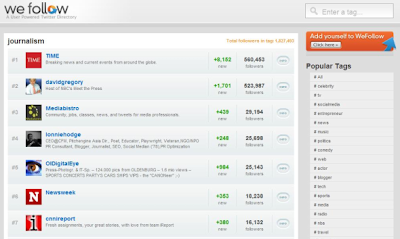 To get added, users pick the three hashtags under which they want to be listed and then tweet the results to submit the listing. publicadas por andrés Azócar a la/s 3:42 p. m.
¿Pueden ser rentables las noticias? ¿Están los medios enamorados de Marco? ¿Pueden ser rentables las redes sociales? ¿Salvar a los medios o salvar el periodismo?